When customers think about a brand, they usually connect it with a lifestyle it represents. Because of this, many startups fail, as they don’t establish an emotional connection and representation of their brands. Regardless of the lifestyle a brand represents, it should be one of the marketing tools that YOU use to evoke emotional engagement and to advance your startup. Some startups disregard the importance of an effective logo design. Sure, they may seem to be less significant than the question of attracting the investment and hiring the right individuals, and of course, logo design should not be ‘top priority’ on your agenda. However, when you start to think about the identity of your new brand, that’s where logo design should not be disregarded. In this post, I will share with you some effective logo design pointers to help you create a brand with a strong and recognizable identity, so let’s get straight to it. Why does a startup need a logo? First, a good logo helps to make a good first impression, which is critically important for a company that is just starting out. According to stats posted by CrowdSpring, it only takes customers 10 seconds to form a first impression of the logo, but up to 7 impressions are required to memorize it. Clearly, you don’t want that first impression to be bad because if customers find it unappealing from the word ‘go’, it’s highly likely they’ll avoid buying anything from you. Second, a logo can be the tool that inspires trust in your brand. If customers don’t feel enticed by the logo they see, they will not engage because you have no clear representation. In today’s business, trustworthy relationships between brands and customers are a vital component of success, so don’t underestimate the power of the logo. Having established the reasons why you need a logo, let’s work on specific elements. Any experienced marketing professional will tell you that the first thing you need to look for is uniqueness. Check out this article on Design Contest to learn why uniqueness is important. There are thousands of brands out there, and each of them has a logo! It is certainly encouraged to think outside the box to come up with a great design because the customers have seen a lot of logos in their lives. So yours should be the most memorable! Logo designers recommend following certain criteria when designing a logo. For example, too many special effects should be avoided to make it as simple as possible (we want people to recognize it), and other logos must not be copied (otherwise you will be perceived as a copycat). A color is one of the vitally important factors in this case because humans are highly responsive to visual stimuli. To make the color work for your benefit, you must select the right ones and harness the power of color psychology (yes, there is a science that studies that, too). Every color you choose has certain implications for the overall logo design. That’s why one needs to select them carefully and use the ones that grab attention. For example, if one takes a famous McDonald’s logo and changes yellow and red colors to purple and blue, it turns into something else entirely! The perception of this logo by many customers will also be completely different. Here are the meanings of the most popular colors used in marketing, including red, green, blue, yellow, purple, black, and orange. The percentages below are taken from this infographic from LogoFactory to illustrate how popular a color is in logo design. Red (29 %). is usually used by brands that need to show passion, energy, warmth, aggression, and danger. This color is often used by food companies because it is known to stimulate appetite (that’s why McDonalds’ logo uses it). Red is in the top five most popular colors used by brands. Green (8 %). This one is used less often than red because it implies that the brand intends to demonstrate ethical and natural credentials. Food companies use it to make customers feel safe engaging with the company as well. Whole Foods Market and Subway are perfect examples of usage of the green color to demonstrate aforementioned points. Purple (1 %). For many, purple would not be the first choice. However, a lot of companies are using it, including FedEx, Craigslist, Taco Bell, Wonka, and Yahoo. The color implies majesty, rich creativity, royalty, and uniqueness (what says more about uniqueness than purple, right?). Orange (10 %). If your startup needs to show its passion modern thinking and strive for continual innovation, you should consider using this one. That’s why SoundCloud, TNT, HTML5, Mozilla, JBL, and other high-tech brands are using it. In addition, orange is thought to stimulate appetite like the red color. Yellow (25 %). Experienced logo makers often say one should be careful with this aggressive color because it signifies cowardice in warning signs. If used properly, it implies positive nature, warmth, and friendliness. The list of famous brands that use this color includes IKEA, Good Year, Best Buy, Ferrari, Nikon, CAT, and Shell. Black (37 %). This one is used mostly by high-end brands. Although this color is commonly associated with sophistication and power, many people also view it as a color of death and villainy. Famous examples of black logos include Apple, Adidas, Chanel, Honda, Lexus, Zara, L’Oréal, Nike, Nestle, and Gucci. What if I want to use multiple colors? That’s a perfectly fine decision as well. However, you should consider making it only in case if your logo needs to evoke fun, easy-going nature, innovation, and children-friendliness of your brand. Google, Microsoft, eBay, NBC, PlayStation, Smart TV, Sprite, and Skittles are among the most prominent companies that made the same choice. 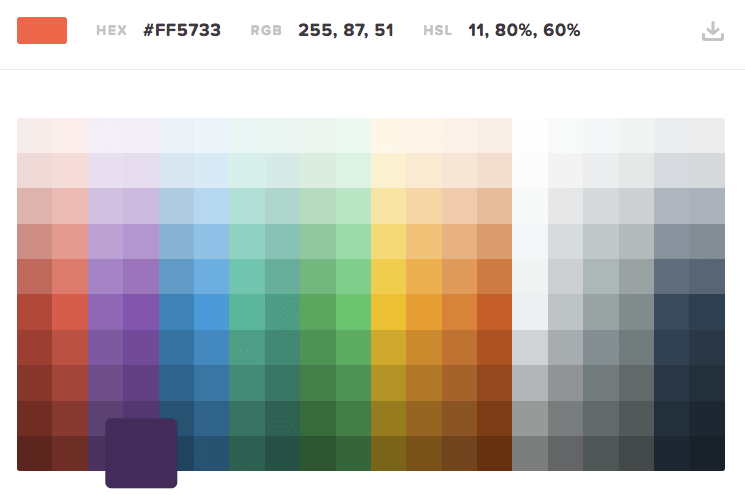 Color chart screen shot taken from HTML color codes website. Even though multiple colors in a design of a startup is a good idea, the common implication of such logos is that the companies they represent are offering a wide range of products and services. The examples of Google, Microsoft, and other companies mentioned above perfectly illustrate this point. So, if your startup focuses on a limited range of products or services, it might be a better idea to go with one or two colors, tops. It is highly recommended to include the name of the brand in the logo in case you’re just starting your business. No one really knows your company, so you have to help people to memorize it. As soon as you develop to challenge bigger brands in the industry, you can eliminate the title because the target audience knows it. The best advice for you is to come up with a unique font. Let’s face it, most of the existing fonts have already been used a million times. If you have to go with an existing font, Langdon, Rex, Vincent, Code Pro, Infinity, Domine, Dosis, and Odin Rounded are good choices. Check out this Entrepreneur article to see how they look. Starting a brand is a challenging and demanding project that can make you forget about the logo. However, I strongly recommend you to give it the attention it deserves because it will improve your chances of success in the short- and long-term. Meanwhile, you can go to a logo inspiration library like LogoSpire to see how professionals design beautiful logos and get creative process going. Lucy Benton is a marketing specialist, business consultant, who currently works at www.bestessaytips.com. She helps people to turn their dreams into the profitable business. Lucy writes posts for websites, blogs related to marketing. Feel free to contact her on FaceBook. I created my brand logo – or, had it created – to reflect my lifestyle, and to capture the essence of island hopping through smart blogging. Then I plastered my palm trees and green colors and smiling selfie all over everything LOL. The logo should reflect the brand message. I envisioned what I wanted to say about blogging from paradise. Then I had my designer speak the message with a picture. Good note on colors too. Pick ones that induce emotions you want people to feel. Hi, Ryan how are you, ma’ man? So glad you enjoyed this post, and absolutely, I think you have your logo design and message nailed. Even for someone new to your site, you instantly can tell what your brand is about, very well done. Have a super awesome weekend bro.